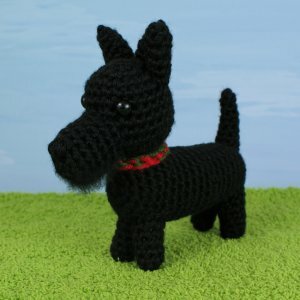 An original crochet amigurumi Scottish Terrier (Scottie) dog pattern from the AmiDogs range by June Gilbank. Note: Take advantage of the savings when you buy any three AmiDogs breeds of your choice as a custom set! Bonus: All AmiDogs patterns now come with a free bonus 1-page PDF for a simple but effective crocheted collar. The collar pattern will be included automatically when you add this item to your shopping cart. Date Added: 03/30/2016 by Linda S.
Date Added: 07/18/2015 by Jaclyn M.
Date Added: 01/12/2013 by Morgan S.